On October 23rd 2013, HARFIR participants gathered at the University of Bielefeld for the project’s Kick-Off Meeting. 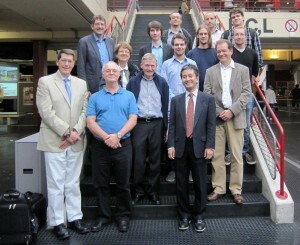 The meeting was hosted by Professor Günter Reiss, who holds a chair for Thin Films and Nanostructures in the University’s Fakultät für Physik. The day’s activities included formal meetings of the project’s General Assembly and its Project Steering Committee. HARFIR is a 43-month R&D project which started in September 2013 with the goal of discovering an antiferromagnetic alloy that does not contain the rare metal Iridium. It is partially funded by the European Commission’s Directorate-General for Research & Innovation through its Framework Programme 7 and also by the Japan Science and Technology Agency through its Strategic International Collaborative Research Program. Kick-Off Meeting attendees travelled from Belgium, Poland, Hungary, Germany and the UK to give presentations on each partner, to discuss the project’s organisation, procedures, aims and objectives, and to plan the work for the coming months. They were also treated to a tour of Professor Reiss’ laboratories, where activities comprise preparation of ultrathin magnetic and oxidic film systems and investigations of their electronic and transport properties, including experiments with nanopatterned samples. At the end of the meeting, all those involved posed for the attached group photo on the steps of the University’s massive central walkway.